The Oppositelock Can-Am Championship Is Moving To Forza 7! Have you been playing Forza 7 and want to test your skills? Come play Forza with other people from Oppo! The Oppositelock Can-Am Championship is moving to Forza 7. If you’re interested in joining in, click here to go right to the sign up sheet. Apart from the game switch, not much will change. All previously established rules will remain in place. We are still going to be using the Oppositelock Racing/Digital Burnouts Discord to communicate during the races. HERE IS THE INFO AND SERVER ACCESS LINK FOR THE DISCORD SERVER. 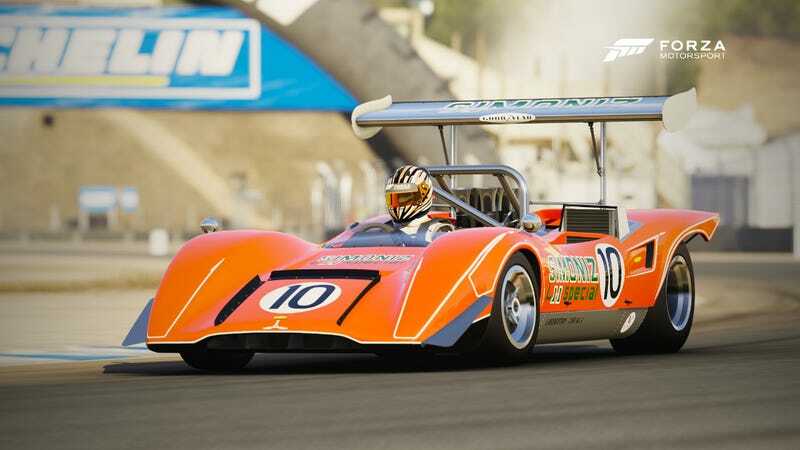 All cars will now follow Forza’s homologation standards for Group Prototype. Specifically, all cars must run stock tires, have less than 600 HP, and meet a PI of R850. Beyond that, you have free reign of what parts go on the car. This may change as I finish purchasing all eligible cars. There will now be a 2nd points championship for the last 3 rounds in Forza 7. There will not be a drop round for this championship. The original points championship will still continue as is. And one last thing: the next round at Road Atlanta Full will be this Saturday at 8:00 PM EST. Please note that I am still finalizing lobby hosts so there is a small chance this time will change. So if you were planning to race in RIGTC and still want to race, you can now race the most dangerous cars to come out of the 1960s instead! Expect a pre-race post for this soon.